You have to be pretty stupid, or pretty drunk, to lead the police on a car chase. 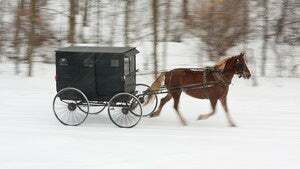 You have to even drunker, and certainly more Amish, to lead the police on a car-vs.-horse-and-buggy chase. resisting arrest, second-degree obstructing governmental administration, unlawful possession of an alcoholic beverage with intent to consume by a person under age 21, failure to yield to an emergency vehicle, insufficient tail lamps and littering on a highway. Why do we tolerate the Amish, who are frequently trying to outrun the police and sext our children? The answer: Scrapple.